The spout and handle of hansgrohe's Metris Classic mixer range have light, modern curves, and the chrome finish gives the mixers a strikingly decorative look. With their elegant design, these mixers exude the luxury of bygone times. Use Metris Classic to prepare a lavish ComfortZone for your customer. A plus for the environment: the water and energy-saving EcoSmart technology is automatically integrated in Metris Classic products. 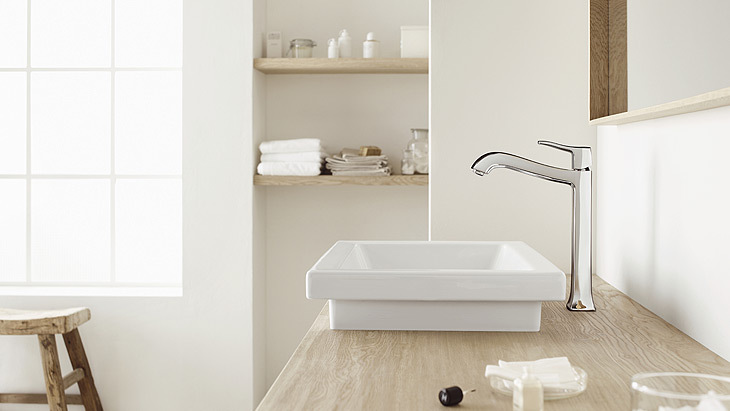 Here you will find subtly elegant mixers for wash basins & bath tubs, showers and bidets. The range includes wash basin mixers in different heights for various customer requirements, and bath & shower mixers for exposed and concealed installations. ComfortZone test: Which wash basin matches Metris?